Happy Labor Day! Since today is the symbolic end of summer, I thought I'd start the fall season off on the right foot by sharing four hot trends for autumn weddings. Incorporate gourds, mini pumpkins and purple artichokes into your table settings to create a warm environment inspired by the season itself. Send your guests home with a Mickey or Minnie candy apple as a favor so they can delight in the flavors of fall. Serve up a variety of pies as opposed to wedding cake- you'll be able to save on your budget and your guests will get to enjoy a delicious variety of seasonal delights. Deep purple, red and gold rule the season! 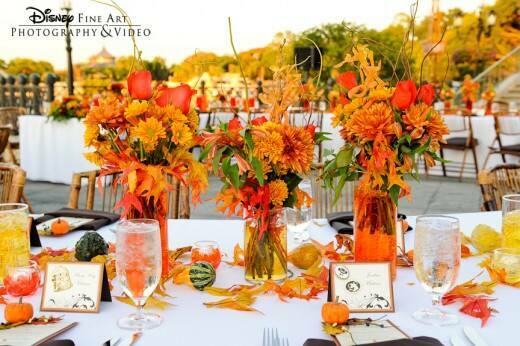 Don't be afraid to think outside the box for your fall bash and incorporate non-traditional centerpieces, decor and food. After all, seasonal touches make your big day one-of-a-kind!